Like many places across the country, Arizonans had a real “aha” moment when the Robert Wood Johnson Foundation and the VCU Center on Society and Health released their life expectancy map for the Phoenix metro area last year. Their study showed a 14-year difference in life expectancy for zip codes that are only a fifteen-minute drive apart. These maps have been excellent at capturing people’s interest and helping them to understand that place matters to health. 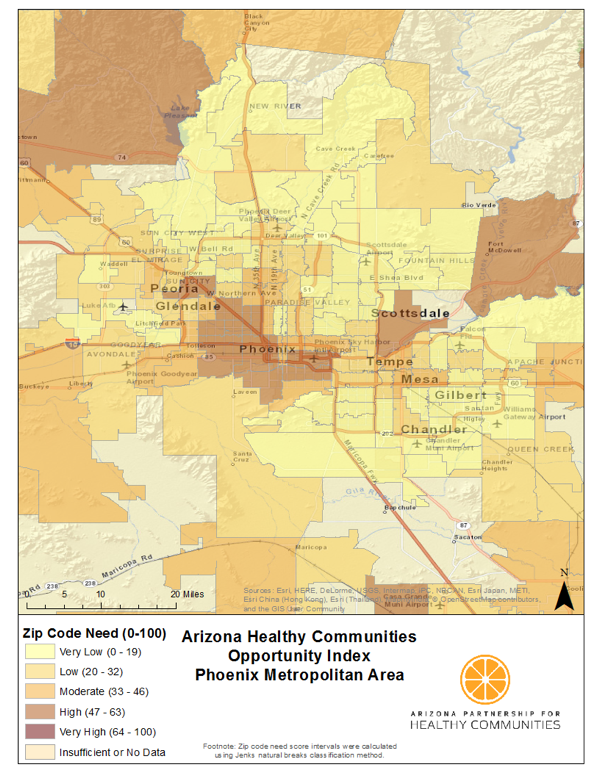 At the Arizona Partnership for Healthy Communities, we’ve taken the phrase “your ZIP code is more important to your health than your genetic code” to heart, so we wanted to dig a little deeper and learn where there were opportunities to make an impact. We wanted to get ZIP code level detail on what’s happening with health across the state. 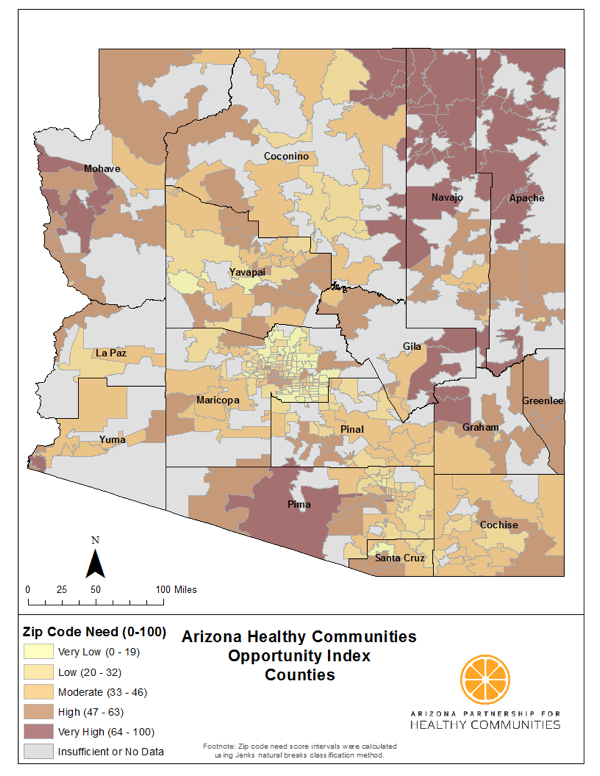 The Arizona Healthy Communities Opportunity Index was created to provide a fuller picture of health disparities across Arizona and to identify areas of opportunity to improve health. We wanted to learn how things like walkability, access to primary care physicians, housing costs, and poverty rates looked across the state. Paul Minnick, a graduate student at Arizona State University, created the Index, maps, and the accompanying report. To create these maps, 15 different data sources were used to gather information for all 403 ZIP codes in Arizona. We incorporated data sources to capture public health, transportation, housing, and socio-economic factors in each zip code. In addition to the statewide map, we also created maps for the Phoenix and Tucson metro areas. Our goal with these maps is to give people a sense of what’s going on with health in Arizona and help the built environment sectors focus their work. We wanted to help inform the conversation about healthy communities and how health involves sectors beyond health care. First, we normalized the indicators to put them all on a common scale. Second, we averaged the rescaled scores together for all of the 15 indicators. Third, we normalized the averaged scores to reach a final composite score. Finally, we mapped the calculated Index to provide a visual representation of the Index. All of the indicators in the Index are weighted equally within each dimension, and each of the five dimensions makes up one-fifth of the final Index value. Our biggest challenge in creating these maps was choosing indicators for which we could get ZIP code-level data. There’s a lot of great data out there, but much of it is available at the county level or by census block. Another challenge was the format of the data. Some of the sources provided information in a way that required us to input the data by hand. Complete data wasn’t available for every ZIP code, so we chose to leave them out of the maps rather than provide an incomplete picture. Finally, we wanted to make sure that we were presenting these maps as an opportunity to direct investments and energy to improve health. Of course, these maps aren’t a detailed picture of everything that’s happening with health in each zip code. It was very important that we weren’t shaming or stigmatizing certain ZIP codes, so we tried to be careful with our language and how we presented the maps. Some of the most encouraging anecdotes to come from the Index are from our partners who tell us this data is useful for better informing their “on-the-ground” efforts. A health insurer told us that they’ve been wondering for a while why some areas saw poorer health outcomes, so they intend to use the data to get a better sense of how they can invest in preventative measures in the communities to improve health. And a number of our partners have used the Index to gather data for reports, strategic plans, and grant applications. We also learned that it’s really important to delve into the data to see what’s happening in each ZIP code. There were a few instances where ZIP codes would receive the same score on the Index, but for very different reasons. Not surprisingly, this happened most often when one ZIP code was more urban and the other more rural. If you’re interested in a similar mapping or data gathering project, we would recommend that you have clarity around who your audience is and what you want to achieve. For the Arizona Partnership for Healthy Communities, it was most important to us that we focused on ZIP-code level data that would help inform our efforts. The Index shows a pressing need for improvements in the health of Arizona’s residents, especially among its vulnerable demographics, including minority residents, families below the poverty line, and residents lacking a high school education. Alleviating the problem is much more complex than just looking at basic health statistics and improving on them. Future endeavors to improve health should be integrated, multisector efforts to improve areas where residents live, learn, work, and play. We’re all in this together; if we want better health outcomes, we need to work in an integrated fashion. 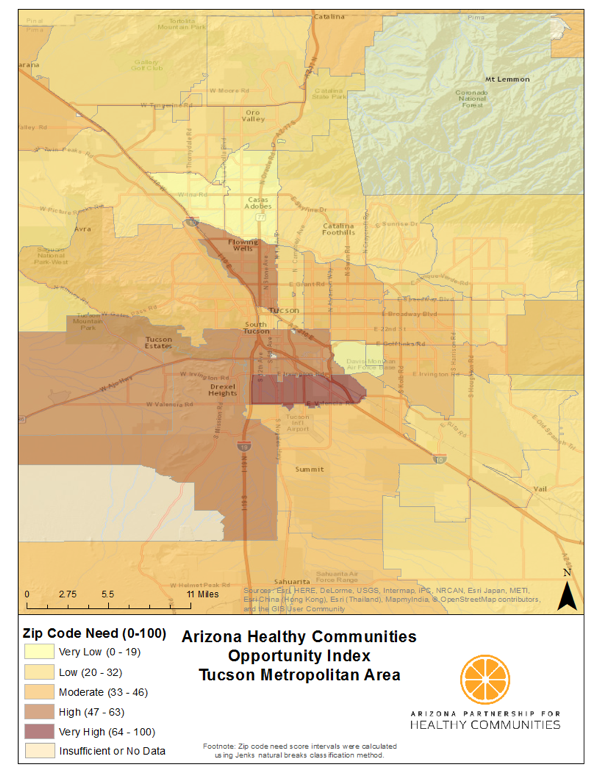 Comments on "Health-Mapping Every ZIP Code in Arizona"